ANYONE WHO HAS browsed a supermarket in the last few years can't help but notice the shelves are practically bursting into flames. Spicy Guacamole Pringles. Tyson Hot 'n' Spicy Buffalo Style Chicken Chunks. Mo Hotta Mo Betta Cayenne Garlic Hot Sauce. Restaurants are no different. McDonald's has its Chipotle BBQ Snack Wrap; Friday's has its Wicked Wings. The spice-driven cooking of India, Thailand, and Sichuan China is responsible for a growing percentage of American takeout dollars every year. It's clear that Americans have developed an addiction to food with sinus-clearing pizzazz. Why is hot so hot? The conventional explanation is that the nation has an increasingly adventurous palate. Immigration and prosperity have made Americans more sophisticated eaters, pushing wasabi peas into the mainstream, along with chili-Thai lime cashews, cayenne chocolate bars, and other high-octane combinations. But some food scientists and market researchers think there is a more surprising reason for the broad nationwide shift toward bolder flavors: The baby boomers, that huge, youth-chasing, all-important demographic, are getting old. As they age, they are losing their ability to taste - and turning to spicier, higher-flavor foods to overcome their dulled senses. Chiefly because of degenerating olfactory nerves, most aging people experience a diminished sense of taste, whether they realize it or not. But unlike previous generations, the nation's 80 million boomers have broad appetites, a full set of teeth, and the spending power to shape the entire food market. "There's no question that as the baby boomers are aging they're losing their taste buds, and as a result they're drawn not only to more spicy foods, but to more flavorful foods of all kinds," said Phil Lempert, a food market analyst who runs SupermarketGuru.com, which tracks consumer trends in supermarkets and restaurants. "So we're seeing sweet things be even more intense in their sweetness. And look at sales of salsa," he said. "First the big seller was mild, then medium, and now hot, and that really correlates with the population boom." Older adults have the highest preferences for boldly flavored cheeses, such as blue, feta, and Gorgonzola, according to Sloan Trends Inc. in Escondido, Calif., which tracks behavioral and consumer habits in food and nutrition. 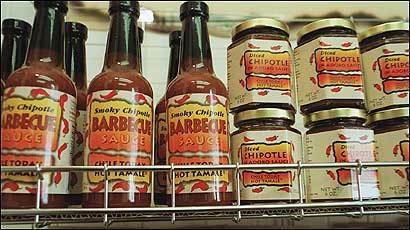 Eighty percent of the 2 million annual visitors to Fiery-Foods.com, a website for aficionados of chili peppers and barbecue sauce, are men 45 and older, according to Dave DeWitt, who runs the site and also publishes Fiery Foods and BBQ magazine. Increased spiciness is just one of many ways the wealthiest, most influential demographic group in US history is changing how we eat. Market research shows boomers have helped drive consumer demand for organic foods, grab-and-go foods, nutritionally enhanced products, and fresh local produce. As boomers continue to age, they will almost certainly keep reshaping the American foodscape, ushering in the same kinds of changes they have brought to sectors of the economy as disparate as music and mutual funds. And as restaurants and food manufacturers come to terms with the surprising new preferences of older palates, their influence will affect what we see in stores and on menus for years to come. So far, few marketers or researchers have studied the link between boomers and spicy food. The industry is just now starting to draw the connection, food scientists say. Research in this area has been slow in part because the science of smell and taste is complicated and still emerging. What's known is that at a certain age - after about 40 for most people - the number of nerve receptors in the nose and tongue that respond to smell and taste dim and decrease. As that happens, complex flavors become duller. Sweet and sour tastes decline sharply; salty and acidic tastes remain brighter for longer. The tastes that penetrate the fog most clearly come from another group of flavors called sensory irritants. These hit the body not through taste or smell, but through the chemosensory system, which conveys sensations like touch, temperature, pain, and pressure. A list of foods in the sensory irritant category reads like a roster of modern flavorings: habanero, jalapeno, black pepper, horseradish, ginger, cinnamon. All of them - generally lumped together as "spicy" or "high-flavor" - help kick up the overall sensory experience of eating. In the past several years, they have started to appear in some unexpected places. The H.J. Heinz Co. five years ago launched a line of flavored ketchups and had the most success with its "hot and spicy" version. Dagoba Organic Chocolate makes a dark chocolate bar with aji amarillo, a Peruvian yellow chili pepper. At McCormick and Co., the world's largest spice company, product developers five years ago produced a red-hot Saigon cinnamon as an alternative to the sweet Indonesian cinnamon the firm has sold for decades. It also recently released an Asian spiced sea salt and cinnamon chipotle grilling rub. Despite a lack of hard data, some industry specialists see the demographic inference as obvious. "Clearly, boomers are buying foods with more flavor, so the food industry is going to put more of those out," said John Finley, head of the food science department at Louisiana State University. "Baby boomers want more gratification in their food, so we're going to see more restaurants pop up with more interesting, more intense flavors, and in the consumer products industry we're going to see new flavor enhancers explored in more depth." In the restaurant business, that change is well underway. Thirty-five percent of all chain and white-tablecloth restaurants mentioned the word "spicy" on their menus a decade ago; by last year that number had risen to 54 percent, according to MenuMine, a menu item database compiled by the Foodservice Research Institute in Oak Park, Ill. In the processed-food industry, scientists are also tackling the challenge in some surprising ways. Beyond amping up flavor, they have found that changing the appearance or texture of food can improve a taster's experience. Food science research shows that the color red, for example, is a strong stimulus for enhancing food's acceptability among the boomer age group. And foods with more texture - or "mouth feel," in industry lingo - can also heighten taste. In a broad sense, the food industry has been trying to tune into boomer tastes for years. "Whether they're trekking to the newest Nicaraguan, Tunisian, or Vietnamese restaurant, picking up cooking tips from intrepid TV chefs, or prowling the aisles of international markets, boomers want strong, complex flavors and new preparations to jazz up their daily fare," concluded a December 2005 report by Packaged Facts, a provider of consumer goods research. Still, some industry watchers chide the business for not more quickly recognizing how to target today's older eaters. The traditional roster of senior-focused products - Ensure liquid shakes, fiber supplements - is a far cry from the tastes and self-image that Boomers take with them to the supermarket. "The industry is having this wake-up call and saying, 'Oh, my God, right before my eyes everybody's older, and that means they have different food preferences,"' said A. Elizabeth Sloan, president of Sloan Trends Inc. "So the industry's realizing they need to reorient themselves to their changing palates." Added Sloan: "The message is: Wake up, food industry and restaurant industry. You guys need to start paying more attention to these people. But they're finally starting to get it because they're seeing where the dollars really are." The business opportunity is huge. People 55 to 64 are the highest restaurant spenders, at $1,294 annually per capita, according to the National Restaurant Association, followed by those 45 to 54, who spend $1,175 a year on average. Projections from Met Life Market Institute show that by the time the last boomer turns 65 in 2030, the generation will control more than 40 percent of disposable income in the United States. Besides having a physiological preference for foods with more oomph, many boomers are now empty nesters rediscovering the joys of home cooking, and are eager to experiment with techniques they've read about in food magazines or seen on cooking shows. And there's still plenty of shelf space alongside the Smokin' Cheddar BBQ Doritos, Hershey's Sweet and Salty Granola Bars, and Crazy Mother Pucker's Maniacal Mustard. Food-industry observers suggest that as the business starts to supercharge flavors, manipulate textures, and tinker with colors to appeal to boomers, the real hurdle may be marketing. How, exactly, should companies promote foods designed for people of advancing age - especially when the target consumers are a proudly youthful contingent still coming to terms with their mortality? "We haven't figured out how to market foods like that," said Fergus M. Clydesdale, head of food science at the University of Massachusetts at Amherst, "because 'food for old folks' just doesn't work."